[Announcement]: And The Winner of the Who’s That Girl Contest Is? Remember we announced our Who's That Girl? contest in May? 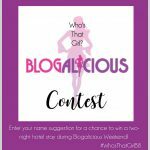 We needed you to help us name the mysterious woman in the Blogalicious logo, because after all, she's been down with us the longest. That feat alone deserves a naming ceremony. 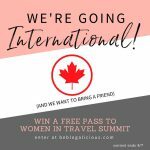 The rules stated that whoever came up with the best name for our mystery woman would win a complimentary two-night hotel stay at the Grand … [Read more...] about [Announcement]: And The Winner of the Who’s That Girl Contest Is? Special Sponsor Event Announcement: The BlogHerLicious Vlog Festival at #Blogalicious5! 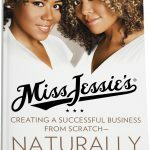 BlogHer is back as a sponsor of Blogalicious Weekend! This is BlogHer's 5th year supporting our community and we just couldn't be happier to welcome them back. This year we've come up with something exciting, creative and never-before-done: a vlog festival, where the video submissions come from you! 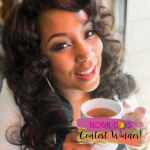 Here's how to get in on the fun: Starting today, July 8th, 2013, you can … [Read more...] about Special Sponsor Event Announcement: The BlogHerLicious Vlog Festival at #Blogalicious5!